Many times I've sat here, reviewing video games, and lamented the downfall of the "B-Game." See, when I was growing up, there was no such thing as "Indie" yet. Games were either big-budget AAA affairs or, more often than not, B-games. B-games were a bit cheaper, a bit smaller—but also, by that same token, you occasionally got a B-game that took massive risks because hey, the consequences for failure were smaller. 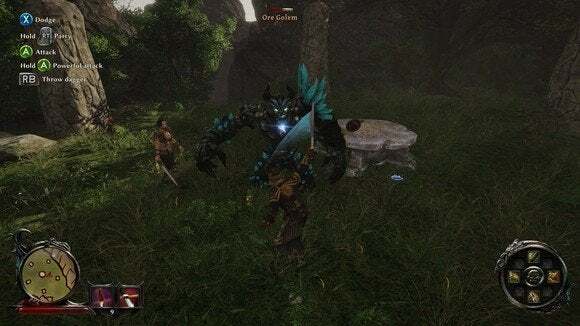 On the other hand, playing Risen 3: The Titan Lords has reminded me of the other type of B-game—the ones where you thought to yourself, "Hey, I feel like I've played this game before...only better." It's not bad in any traditional sense. It's not broken, it's not particularly buggy, it's not offensive. In fact, it's perfectly inoffensive—the game equivalent of a bag of chips, consumed for no reason other than it's around and you're hungry. And that's fine. It's just not very inspiring. 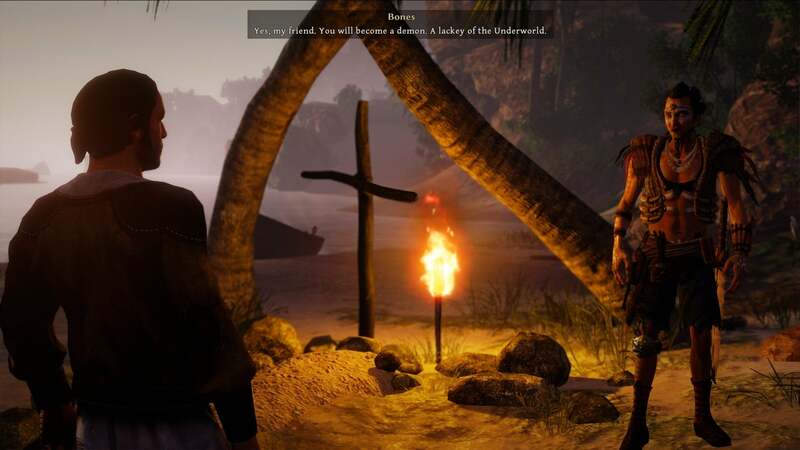 Risen is a massive third-person RPG, set across multiple islands in some sort of pseudo-Caribbean setting. You're a pirate, but you're also kind of a knight—the Risen series still can't quite shake the trappings of developer Piranha Bytes's old Gothic series. 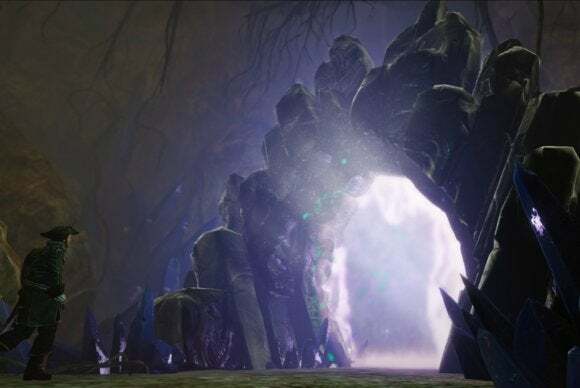 In fact, the overwhelming feeling with Risen 3 is that Piranha Bytes just keeps on making the same game over and over, never quite fixing its mistakes. 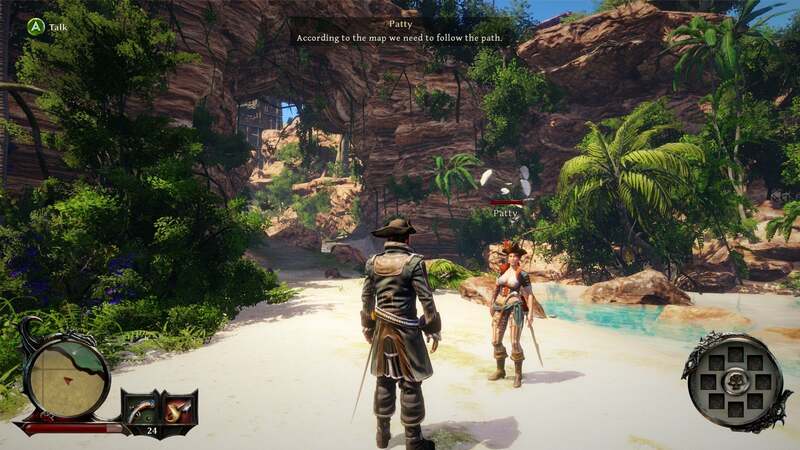 People complained because Risen 2 threw you into the story without recapping the original Risen in any way. Risen 3 does the same, immediately propelling you into a narrative involving Captains Crow and Steelbeard, expecting you both to know and remember the lore of the previous two installments. Woe betide any character who recurs from an earlier game, because you'll also be expected to remember seemingly insignificant details about those characters or else feel lost and confused. It doesn't really matter though, because Risen 3's story isn't particularly strong—another hallmark of Piranha Bytes games. Most quests are inane, "Kill X Amount of Y" quests or—even worse—fetch quests. In many cases you'll finish a half-dozen or so before you're even assigned these tasks, just by wandering randomly around the island. Suddenly, you'll see text popping up—"Scavenger 1/3," "Scavenger 2/3," "Quest Completed: Kill the Scavengers"—before anyone tells you to go kill said animals, making it pretty awkward when someone says "Hey, go kill these things that are terrifying our small island village," and you reply, "Oh, sorry, I already did." Oh yeah, the story. 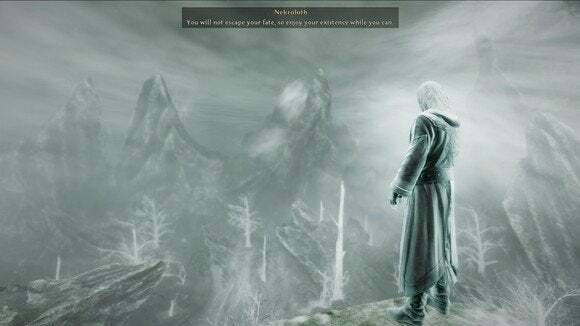 The Shadows are invading, and it's up to you to stop the realm of the dead from spreading across the land—except you die in the prologue and are subsequently brought back to life, so you're also on a quest to regain your soul. This latter fact seems to not faze a single person in the game, despite apparently being a rare occurrence. Even your dear ol' sister, who buried your body in the prologue, responds with barely an eyebrow-raise when you meet up with her later. "You're alive," she says nonchalantly, "but I buried you." Yeah, thanks for that. My mouth still has dirt in it. Another thing: Risen's world hasn't gotten any less awkward in its handling of the so-called natives. They're still an awkward caricature of South American tribes, like something out of a Saturday morning cartoon. It's...well, it's just weird. True to form, Piranha Bytes also failed to improve combat in any meaningful way here. It's harder to get stuck in a knockdown loop (a.k.a. 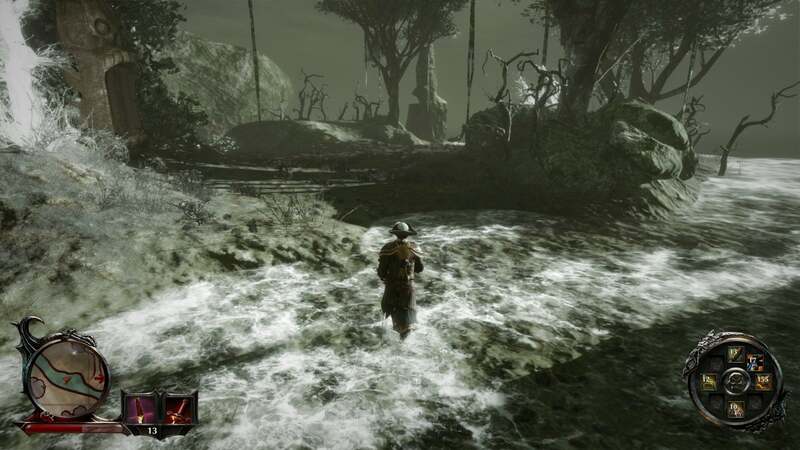 where an enemy attacks you a second time faster than you can recover from the first attack, trapping you in a feedback loop that results in your death) than it was in Risen 2, but combat's still not very fun or interesting. The game is punishing to start. You're going to die a lot. You're going to forget to save, die, and lose a lot of progress. You will be annoyed. You don't have a traditional "class" per se, and are free to mix it up with magic and swords and pistols at will. Each enemy you defeat, each quest you complete, gives you "Glory," which is a lofty name for experience points. You upgrade your stats by spending Glory, with each level of a stat costing progressively more. For example, raising your Melee skill from 20 to 25 might cost 500 Glory, while raising it from 50 to 55 might cost 7,500. You'll basically end up focusing on one or two skills to start, then eventually get tired of waiting between levels and start filling in the rest of your skills. It's a great class-free system, though it also makes it a bit easy for every character you make to feel the same. Luckily the story forces you to join one of three factions midway through the game, and each faction plays a bit differently. This is the main way you'll differentiate your character, and the key factor in the "replayability" of Risen 3. As I said, combat is punishing when you start. Enemies almost always come at you in gangs. You'll spend most of your time dodging—because for some reason, you're invulnerable when rolling. Your first companion is named Bones, and he'll periodically take time away from fighting creatures to heal you. Use Bones. He will save your life over and over again. Low on health? Just roll around in circles until Bones heals you! It's exploitable. It's broken. It's awkward. Risen 3: Titan Lords could be retitled Risen 3: Kiting Lords because I kited every single enemy I encountered in the game. For hours upon hours. You have to purchase most of your high-level skills, but then things go the other way—combat is overly easy once you're ten hours in with a few sword skills under your belt. Too hard, too easy—Risen 3 never feels balanced. And that makes combat a chore, either because you're constantly dying and reloading, or because you're plowing through enemies without a hint of danger. But I said Risen 3 is like a bag of chips, and I meant it. You know what? We humans love filling up bars and completing quests, even if those quests aren't exactly the loftiest of affairs. You play a few hours of Risen 3 and you have moderate amounts of fun. It's enjoyable! You finish some quests, you kill some monsters, you earn some gold. If somebody came up to you 24 hours later, though, and asked what you did in Risen yesterday, you'd probably draw a blank. You might be able to name one or two quests, but even the main storyline is mostly elaborate fetch quests. Nothing really sticks with you. It's the game equivalent of empty carbs. That's totally fine. There are better games out there, but maybe you don't want to play a better game, or maybe you've already played those better games. If you're looking for a time-killer—a game to sink hours upon hours into with very little real commitment—then Risen 3 is one of those. And that's why Risen 3 is unequivocally a B-game. Risen 3 isn't particularly strong in any category, but it exists. And if that's reason enough to play a game, then Risen 3 has hours of content for you to play through.